Born in Memphis, TN on May 12, 1906. He was first introduced to boxing while competing in battle royals. He turned professional in 1924 in Memphis and shortly thereafter relocated to Akron, OH. Wins over Tommy Freeman, Bucky Lawless, and Izzy Grove propelled him to the top ten of the welterweight division. 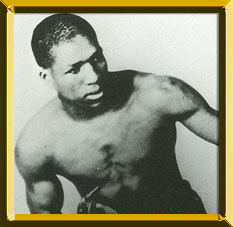 Difficulty in making weight led to sub-par performances against welterweight king Jackie Fields. After Mickey Walker vacated the middleweight crown in 1931, Jones entered a tournament to find a successor for the NBA strap. He stopped Oddone Piazza (TKO 6) to win the title and a defense over Young Terry (W12) followed before losing to Marcel Thil via controversial 11th round DQ in Paris. Jones battled back and, in 1933, beat Sammy Slaughter (KO 7) for the NBA title. Although he never defended the belt, he kept a busy pace and earned one more title bout against NY/NBA champ Freddie Steele (L 10) in 1937. He continued to box until 1940 and retired with a 101-24-13 (52 KOs) record. In retirement he was a chauffeur and bodyguard to Hollywood star Mae West and trained youngsters at the Boys Club. Jones, who was managed by Suey Welch, died on January 4, 1982 at the age of 75.